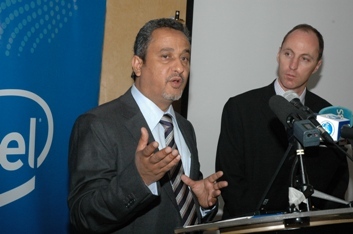 (L)Omar Bajaber, Intel Kenya Country Manager flanked by Danie Steyn, Intel World Ahead Africa Director during the press conference to announce the company’s investments in ICT projects and projections for 2011. Intel Corporation –the world leader in computing innovation – is targeting emerging economies –including Kenya by investing millions of dollars worth of technology projects aimed at bridging the digital divide and boost the country’s quest to become an information hub in Africa. Intel views Kenya and other developing economies as the key markets where huge growth opportunities in computing will come from in the next few years. This stems from the fast growing usage of technology in these markets as well as a largely untapped market in both businesses and individuals. Intel expects that IT budgets are set to increase as companies look for ways to maximize their IT spend for productivity and expansion thus providing great opportunities for Intel. Intel Kenya Country Manager, Omar Bajaber says mobility, affordable yet high speed broadband access will be the key considerations for consumers in 2011 hence they will expect new and affordable devices that would ensure they stay connected. He says providing technology access and IT skills is a cornerstone for future innovation, economic growth and individual progress in the competitive marketplace. Nations must equip their citizens with these critical skills in order to realize their potential in today’s knowledge economy. “We want increased access to technology for everyone as well as to equip learners and teachers with 21st century skills necessary to catapult Kenya into succeeding in the global market and thus in 2011 Intel in Kenya will be looking at ways to make computers more affordable to teachers and students, have localized digital content to be distributed to schools, extend our education programs for teachers and ICT in classrooms to private schools and strengthen our partnership with CCK on development projects”, said Bajaber. Incorporated in Kenya three years ago, Intel has committed millions of dollars to support successful rollout of e-learning initiatives in East Africa targeted at teachers and students – largely improving the quality of education. The projects include deployment of networked computers for student and teacher use, training of teachers to effectively integrate technology in the classroom through Intel Teach Program, deployment of wireless infrastructure within schools, providing access to digital educational content and developing of the local ICT industry to promote economic development. In addition, it has partnered with KIE and Microsoft to establish a School Technology Innovation Centre in Nairobi – a model that has been promoted in other countries. The centre is aimed at research on innovative emerging technology solutions and would serve as a repository and showcase for best-known methods of teaching and learning.